All British Casino – Free Spins on the new slot! Yeehaw! Get your hands on this loot! Hold your horses and prepare for a wild ride this weekend at All British Casino as they offer a whopping 50 Free Spins to celebrate the release of the brand new Western-themed slot, Wild Wild West-The Great Train Heist™. But that’s not all, there’s still time to lasso in this Sunday’s ‘Surprise Spins’ offer! Simply make a deposit Saturday midnight and claim your Surprise Free Spins on Wild Wild West: The Great Train Heist™ too! Get your six-shooter ready to score a large amount of Free Spins in your next heist. To take part, simply deposit £20 or more from 24th to 25th February 2017, 23:59 GMT. 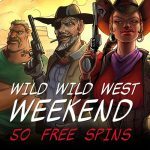 The spins will be instantly added on the new Wild Wild West: The Great Train Heist™ slot after the deposit is completed. The new game is a 5-reel, 3-row video slot with 10 fixed betting lines with an accompanied great twangy Western theme tune. Lovingly created by NetEnt, its comic book style graphics come together to tell the story of a great train robbery by four villains. It boasts clever bonus features including Free Spins, a range of extra Wilds and a Pick-and-Click bonus where you chose from the safe symbols to win up to 50 times your stake.